SPECIFIED COMPRESSIVE STRENGTH OF MASONRY, f′ m.
f ′AAC = Specified compressive strength of AAC masonry, the minimum compressive strength for a class of AAC masonry as specified in ASTM C1386, psi (MPa). f ′m = Specified compressive strength of masonry at age of 28 days, psi (MPa). f ′mi = Specified compressive strength of masonry at the time of prestress transfer, psi (MPa). 2103.2.3 Mortars for ceramic wall and floor tile. 2103.2.3.1 Dry-set Portland cement mortars. 2103.2.3.2 Latex-modified Portland cement mortar. 2103.2.3.4 Furan mortar and grout. 2103.2.3.5 Modified epoxy-emulsion mortar and grout. 2103.2.4 Mortar for adhered masonry veneer. 2103.4 Metal reinforcement and accessories. 2106.1 Seismic design requirements for masonry. 2107.2 TMS 402/ACI 530/ASCE 5, Section 8.1.6.7.1.1, lap splices. 2107.3 TMS 402/ACI 530/ASCE 5, Section 8.1.6.7, splices of reinforcement. 2107.4 TMS 402/ACI 530/ASCE 5, Section 8.3.6, maximum bar size. 2108.2 TMS 402/ACI 530/ASCE 5, Section 9.3.3.3, development. 2108.3 TMS 402/ACI 530/ASCE 5, Section 9.3.3.4, splices. A.1.2.2 – Wind. Empirical requirements shall not apply to the design or construction of masonry for buildings, parts of buildings, or other structures to be located in areas where Vasd as determined in accordance with Section 1609.3.1 of the International Building Code exceeds 110 mph. 2109.3.1.2.4 Modulus of rupture determination. 2109.3.4.6 Isolated piers or columns. 1.Glass-block assemblies having a fire protection rating of not less than 3/4 hour shall be permitted as opening protectives in accordance with Section 716 in fire barriers, fire partitions and smoke barriers that have a required fire-resistance rating of 1 hour or less and do not enclose exit stairways and ramps or exit passageways. 2.Glass-block assemblies as permitted in Section 404.6, Exception 2. 1.In structures assigned to Seismic Design Category A or B. 2.Where the masonry fireplace is constructed completely within the exterior walls. 2111.10 Hearth and hearth extension. 1.Masonry fireplaces listed and labeled for use in contact with combustibles in accordance with UL 127 and installed in accordance with the manufacturer’s instructions are permitted to have combustible material in contact with their exterior surfaces. 2.When masonry fireplaces are constructed as part of masonry or concrete walls, combustible materials shall not be in contact with the masonry or concrete walls less than 12 inches (306 mm) from the inside surface of the nearest firebox lining. 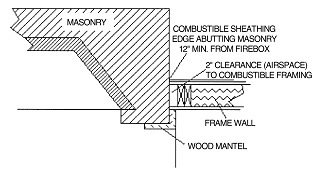 3.Exposed combustible trim and the edges of sheathing materials, such as wood siding, flooring and dry-wall, are permitted to abut the masonry fireplace sidewalls and hearth extension, in accordance with Figure 2111.12, provided such combustible trim or sheathing is not less than 12 inches (306 mm) from the inside surface of the nearest firebox lining. 4.Exposed combustible mantels or trim is permitted to be placed directly on the masonry fireplace front surrounding the fireplace opening, provided such combustible materials shall not be placed within 6 inches (153 mm) of a fireplace opening. Combustible material directly above and within 12 inches (305 mm) of the fireplace opening shall not project more than 1/8 inch (3.2 mm) for each 1-inch (25 mm) distance from such opening. Combustible materials located along the sides of the fireplace opening that project more than 11/2 inches (38 mm) from the face of the fireplace shall have an additional clearance equal to the projection. 1.Masonry heaters shall comply with the requirements of ASTM E1602. 2.Masonry heaters shall be listed and labeled in accordance with UL 1482 or EN 15250 and installed in accordance with the manufacturer’s instructions. 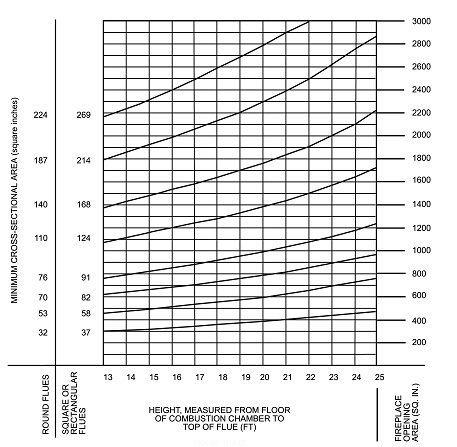 1.Where the masonry heater wall thickness is at least 8 inches (203 mm) of solid masonry and the wall thickness of the heat exchange channels is not less than 5 inches (127 mm) of solid masonry, combustible materials shall not be placed within 4 inches (102 mm) of the outside surface of a masonry heater. A clearance of not less than 8 inches (203 mm) shall be provided between the gas-tight capping slab of the heater and a combustible ceiling. 2.Masonry heaters listed and labeled in accordance with UL 1482 or EN 15250 and installed in accordance with the manufacturer’s instructions. 1.The net free area of the arrestor shall be not less than four times the net free area of the outlet of the chimney flue it serves. 2.The arrestor screen shall have heat and corrosion resistance equivalent to 19-gage galvanized steel or 24-gage stainless steel. 3.Openings shall not permit the passage of spheres having a diameter greater than 1/2 inch (12.7 mm) nor block the passage of spheres having a diameter less than 3/8 inch (9.5 mm). 4.The spark arrestor shall be accessible for cleaning and the screen or chimney cap shall be removable to allow for cleaning of the chimney flue. 1.Clay flue lining complying with the requirements of ASTM C315. 2.Listed chimney lining systems complying with UL 1777. 3.Factory-built chimneys or chimney units listed for installation within masonry chimneys. 4.Other approved materials that will resist corrosion, erosion, softening or cracking from flue gases and condensate at temperatures up to 1,800°F (982°C). 2113.11.1.1 Flue linings for specific appliances. 2113.11.1.4 Oil-fired appliances approved for use with L-vent. 2113.11.2 Concrete and masonry chimneys for medium-heat appliances. 2113.11.3 Concrete and masonry chimneys for high-heat appliances. 2113.12 Clay flue lining (installation). 1.Chimney flues serving oil-fired appliances sized in accordance with NFPA 31. 2.Chimney flues serving gas-fired appliances sized in accordance with the International Fuel Gas Code. 2113.16 Flue area (masonry fireplace). 2113.16.2 Determination of minimum area. 2113.18 Masonry chimney cleanout openings. 1.Masonry chimneys equipped with a chimney lining system listed and labeled for use in chimneys in contact with combustibles in accordance with UL 1777, and installed in accordance with the manufacturer’s instructions, are permitted to have combustible material in contact with their exterior surfaces. 2.Where masonry chimneys are constructed as part of masonry or concrete walls, combustible materials shall not be in contact with the masonry or concrete wall less than 12 inches (305 mm) from the inside surface of the nearest flue lining. 3.Exposed combustible trim and the edges of sheathing materials, such as wood siding, are permitted to abut the masonry chimney sidewalls, in accordance with Figure 2113.19, provided such combustible trim or sheathing is not less than 12 inches (305 mm) from the inside surface of the nearest flue lining. Combustible material and trim shall not overlap the corners of the chimney by more than 1 inch (25 mm).